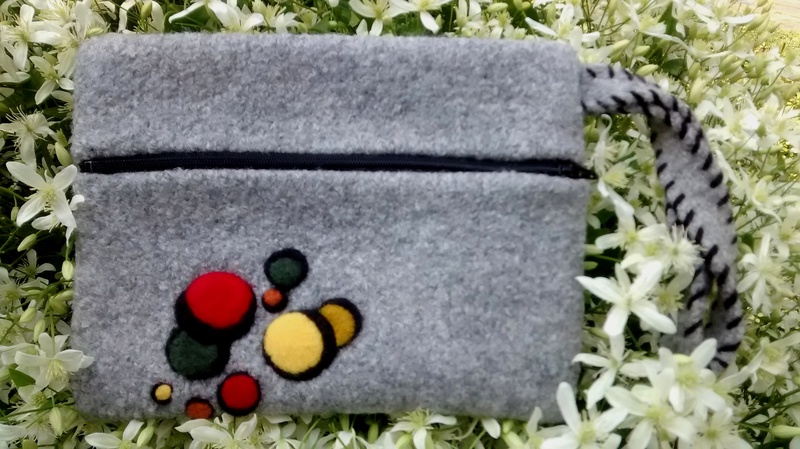 I was having fun making the quilted wristlets and decided to sew one instead of trying to write up a knitted pattern and sew it together before felting. I had fun making this. 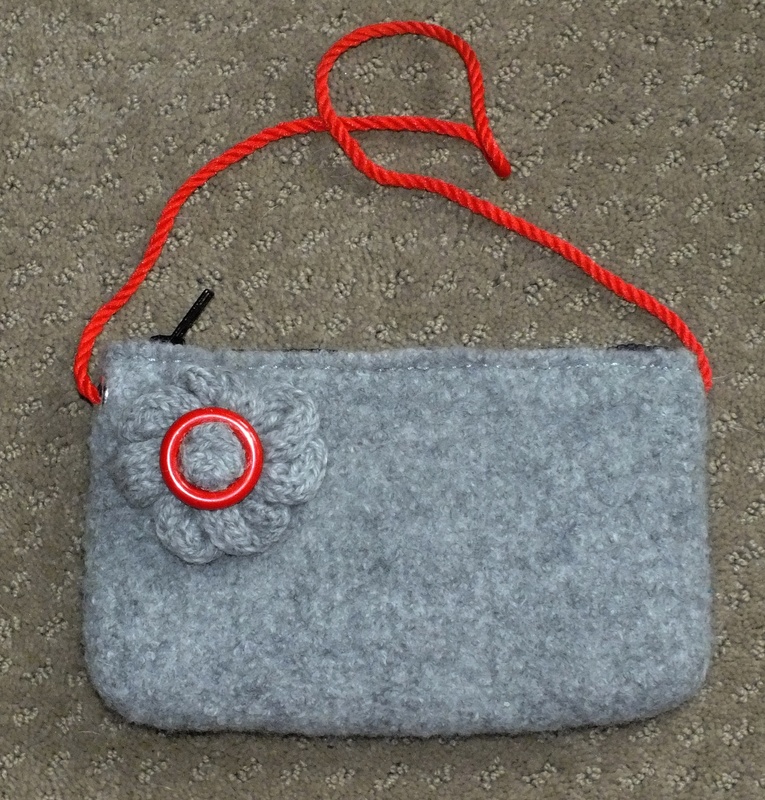 The finished bag is 9 inches wide by 7 inches tall. It is lined with a grey black and white fabric. 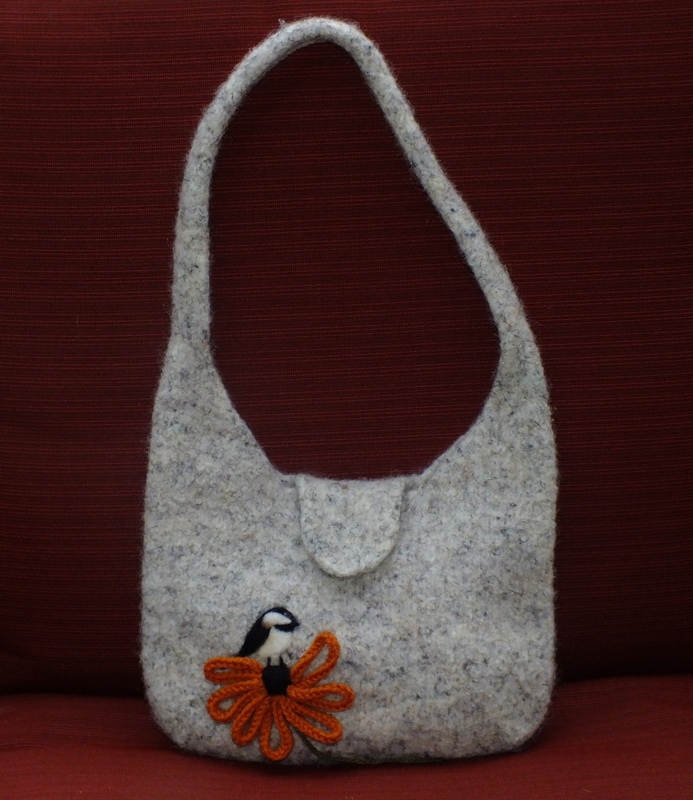 To make this I took one ball of Paton’s classic wool in gray . (3.5 ounces) I cast on 30-30 on the bulky machine and then knitted until I almost ran out leaving enough to cast off. I used loosest mast tension and tension 9 to knit. 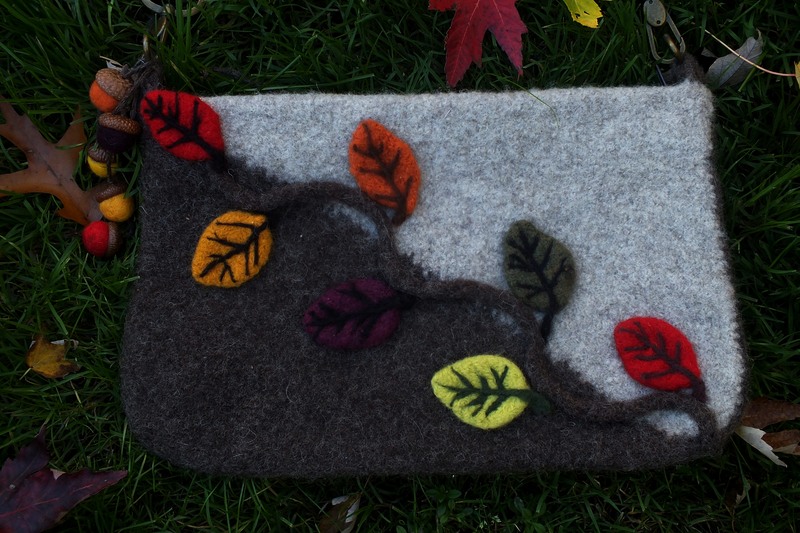 I felted it in the washing machine and came out with a piece of wool about 10 to 11 inches wide and about 15 or 16 inches in length. I cut two inches off of side to use for the strap. The other piece was used for the body of the bag. I used a rotary cutter to square it up. I love the way the zippers are done on the quilted wristlets and I decided to do it the same way on the bag. What a breeze to do. It is easy when the zipper is not at the top for opening. I did not top stitch since I don’t like the way the stitching looks and it is hard to sew in a straight line on felted fabric. I had the lining together with the fabric when I sewed in the zipper. 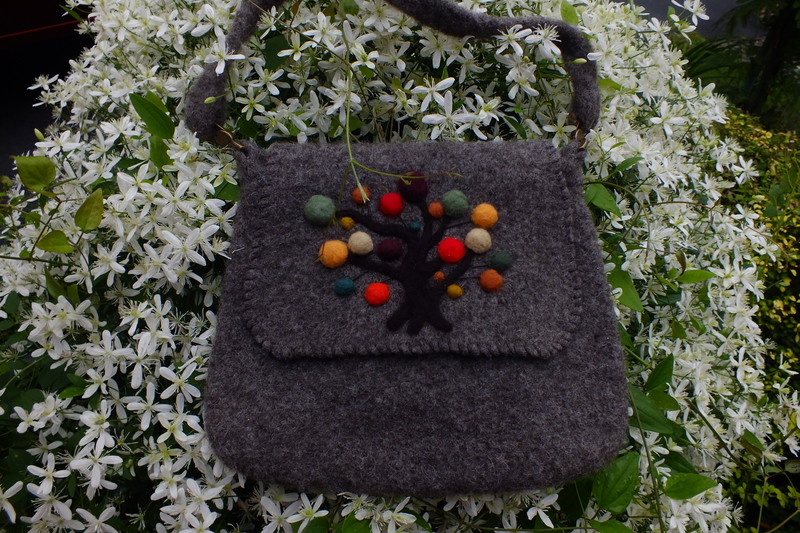 I needle felted a retro design that I purchased from the web site Dreamstime before sewing the side seams. The only thing I did not like is that after you have the zipper in you turn it inside out and sew the side seams with right sides together. That means that you see the raw edges on the inside. To remedy that, I took a 1&1/2 inch piece of lining fabric and cut it the height of the seam. I folded it in half lengthwise and pressed it. Then I opened it up and folded each raw edge of the material to the fold line and ironed it. I enclosed the side seams in by folding it over the seam and top stitching. The inside looks nicely finished. The handle is a cut piece of wool and it looked unfinished as a strap and I did not want rope handle. 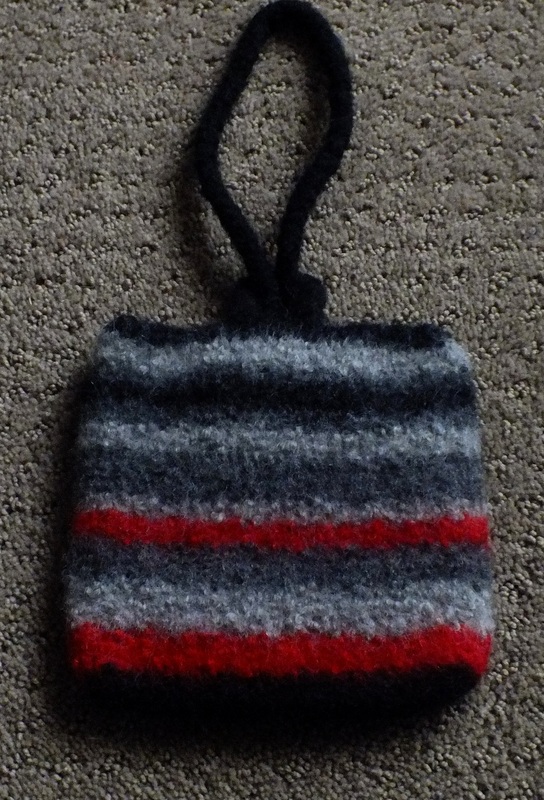 I just took black wool yarn and overcast up and down both sides of the strap. 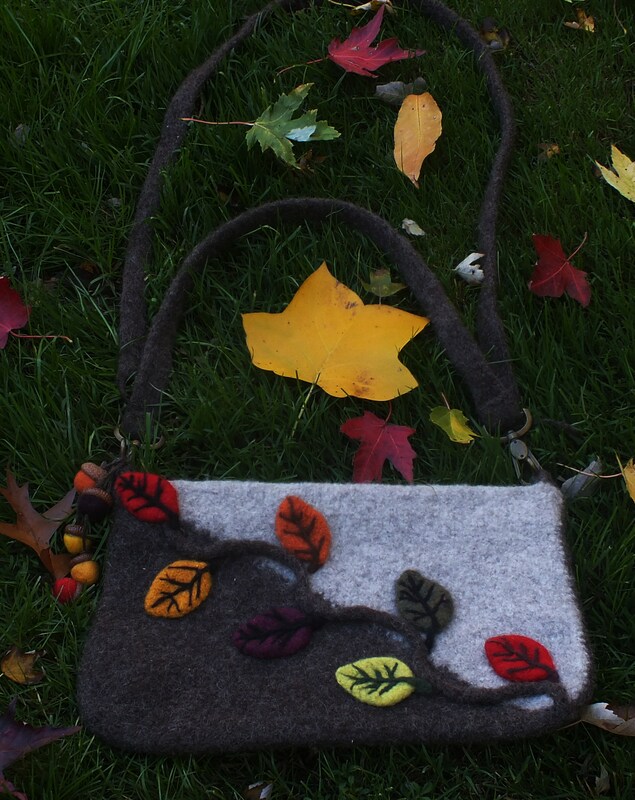 I know a lot of you are not into felting and sewing and this is a lot of work. If you want the directions for the zipper just go to you tube and look up quilted Zipper bag and you will find a lot of tutorials. I can’t find the link for the pattern that I have that shows it step by step. Here is my converted pattern. I started this jacket a couple of weeks back. It was supposed to be a vest at first. It did not look good as a vest (on me that is)so I let it sit unfinished and thought it would go in the scrap pile. Then I decided to put sleeves on it. The idea behind this project was to try Diane Sullivan’s no roll edge for the front band and to put a zipper in the way that I posted on my blog in October 17, 2014. I used Lyon Brand wool Natural. I used tension 4. The cuffs and bottom band start out every other needle . 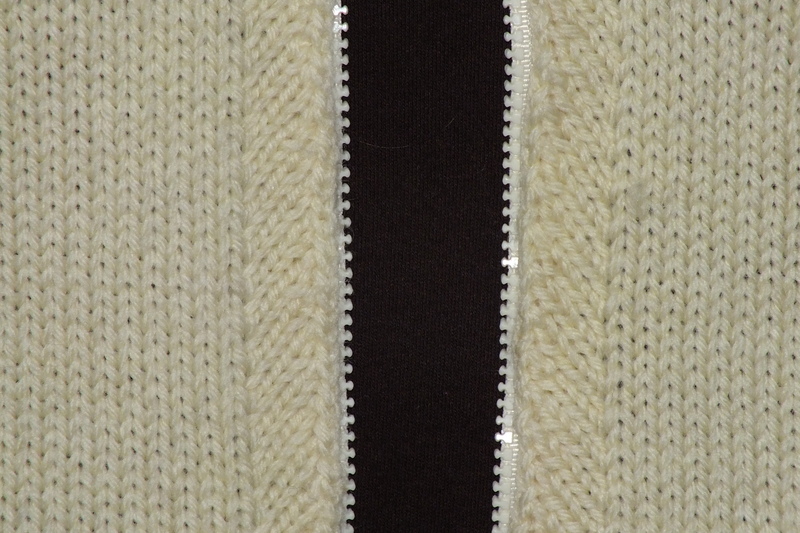 The zipper is cream even though it looks white. I wanted the jacket this length but it should be about an inch longer. I think the downfall on the zipper was the non roll edge. 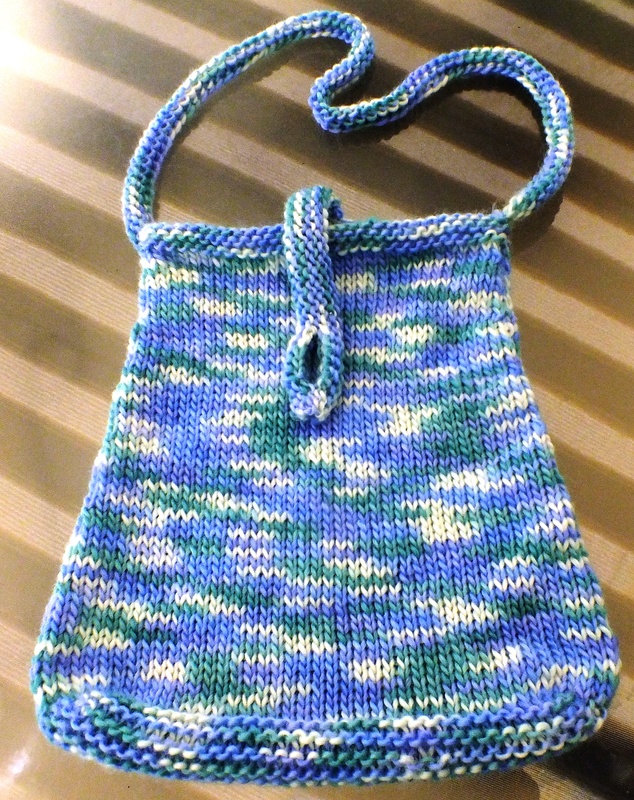 I was afraid to put the edge over the zipper in case it got caught in the yarn. The funny thing is how the neck turned out. 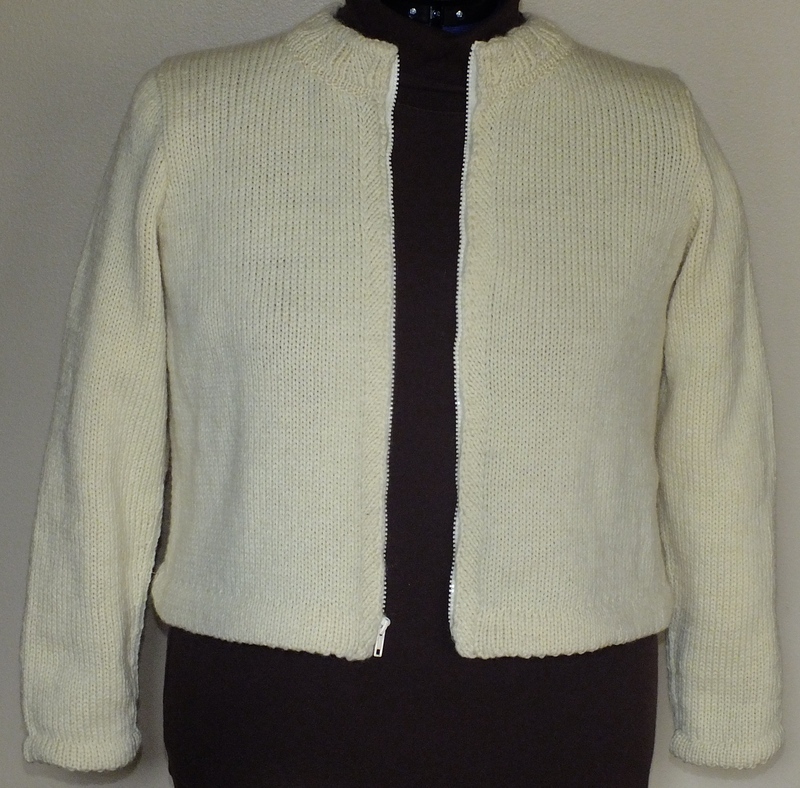 It is the same Diane Sullivan’s no roll edge pattern done horizontally and more rows. I was really surprised it did not match the front when I finished with it. I liked it though and went ahead and attached it using the sandwich method(Not cut and sew). I figured if I wore it open, I did not want a seam showing. I think it is plain but don’t know that embellishing would help. ? It fits and the arms look long but I have long arms and it is perfect length. At least I finished it and don’t have a guilty feeling hanging over me that it was scrapped. I went into my knitting room to start a swatch for a project and this is what I ended up with. It took me the whole day deciding what to do and doing it. Not to mention the disaster my knitting room and house were in after I dragged everything out. I decided to first put away some books laying on the floor that I don’t know where to file. Yep, that got me started. 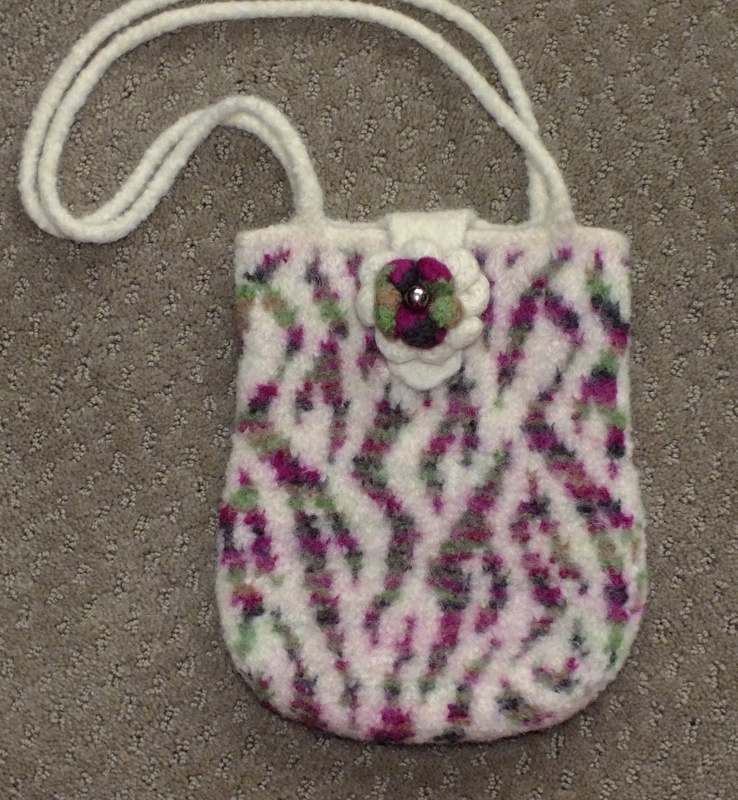 I saw this little picture of a purse that was hand knitted and had a lace edge on the flap and beads. I drew up a pattern for the machine and of course, it had to be felted. I took my stitch and row gauge and started on my pattern. 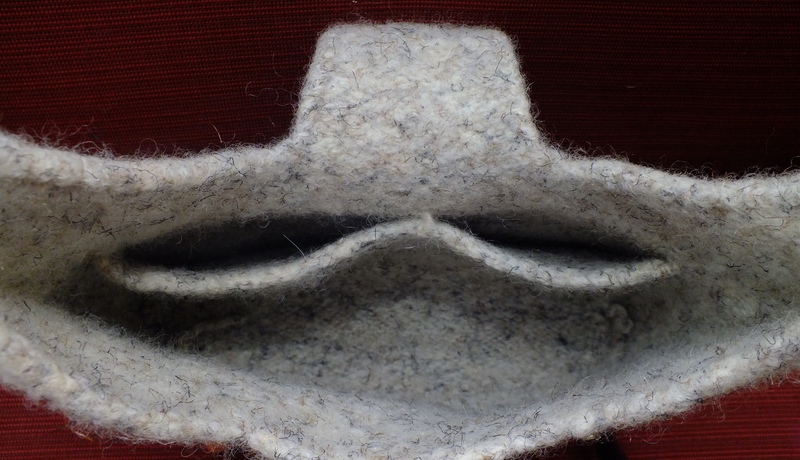 I decided to make the flap with the fun fur I had that had shades of black and grey. 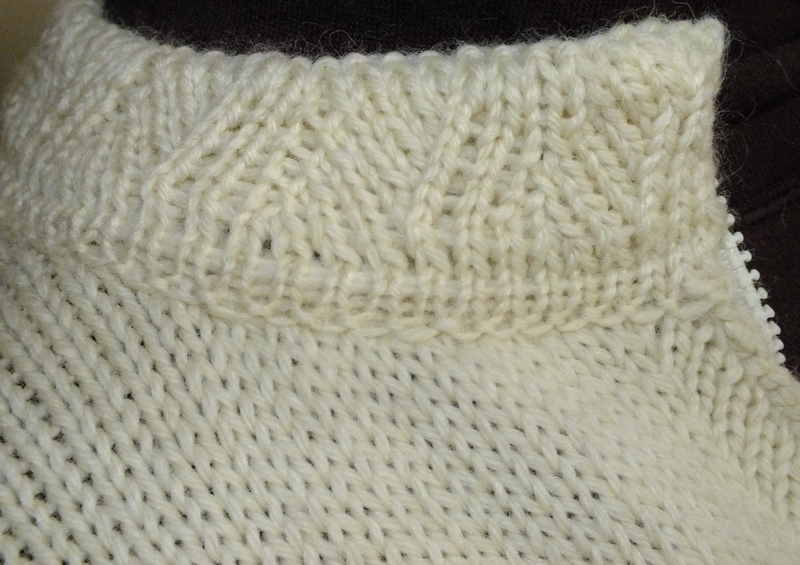 Well, my mistake was that I used the stockinette gauge for the fairisle gauge. Wrong! During felting I checked it and the flap was not felting like the bag. The flap was way too long. After felting I trimmed the flap and it looked okay but the edges felt flimsy. 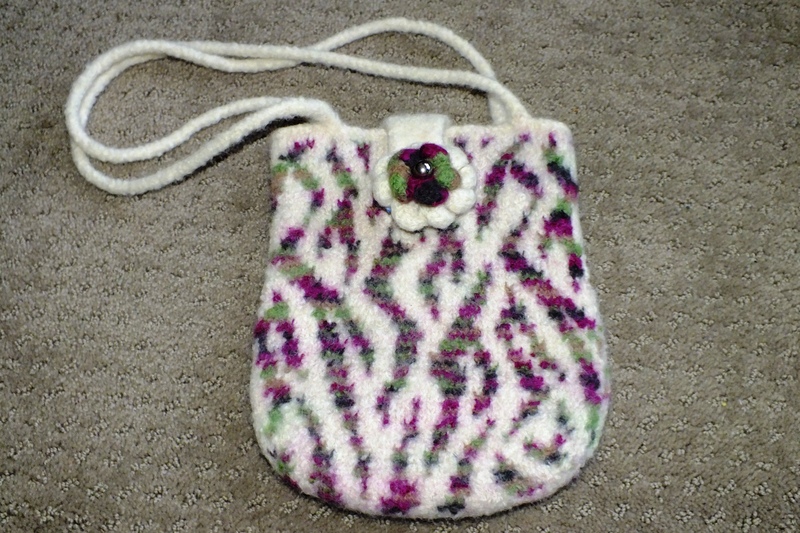 I hated to scrap the purse because it felted perfectly and I liked the size. Scissors, here I come. I cut the flap off totally. Now how do I put a closure on with no flap? Can’t. So I get out sewing supplies and I have a 7 inch black zipper. I have done zippers before and they are not fun on felted fabric. Okay, let’s line it. Dig out my fabric from storage box under the bed (see how I am messing up my house?) Now I have to get my sewing machine and put it somewhere where the light is good. Dining room! (house is getting messier). But before I do the lining I have to figure out handles. Went through more sewing supplies and saw my grommets. Put the grommets in the sides in no time. Didn’t want to felt a handle since I had so much time in this already. Went through box of all cording and ribbon. I found a red nylon cord. Okay, that will not be hot to hold in warmer weather and its strong and the red sets the purse off. Once the handle was done, I sewed the lining pocket to the zipper and then had to put the zipper in by hand. Ooops, can’t felt anything because the lining is in. I made a large knitted flower, used a red button and knitted a center and sewed the flower on. Done! Here is the pattern in my drop box if you just want to make this without a flap. It is knitted all in one piece . Now, here is the picture of what I started with before felting! Just doing some quick gifts before I see my sister tomorrow. 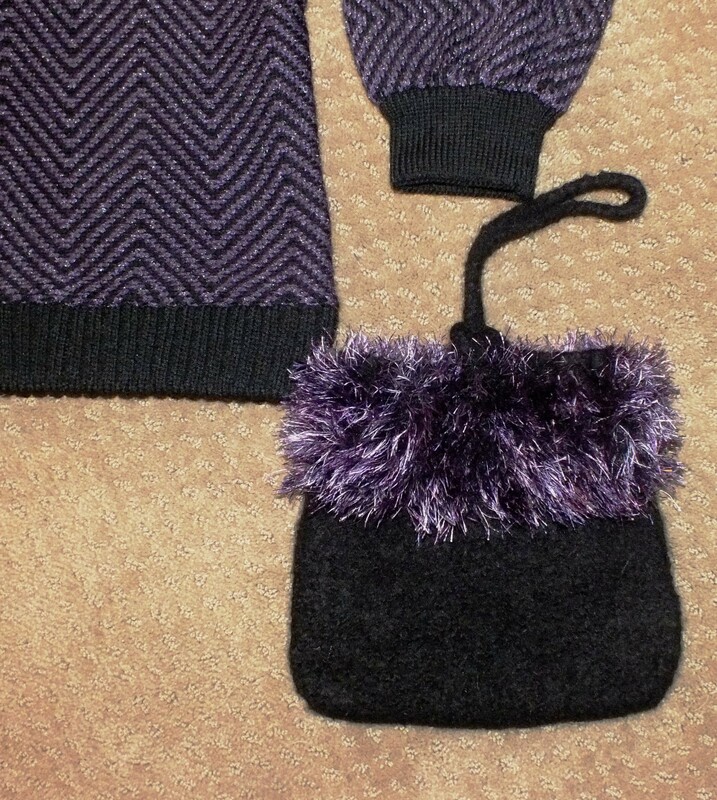 I made her a felted wristlet purse to go with the jacket I made her. The pattern directions are a couple of posts back. This can be made so easily in a couple of hours or even an hour. It only takes ten minutes to felt . 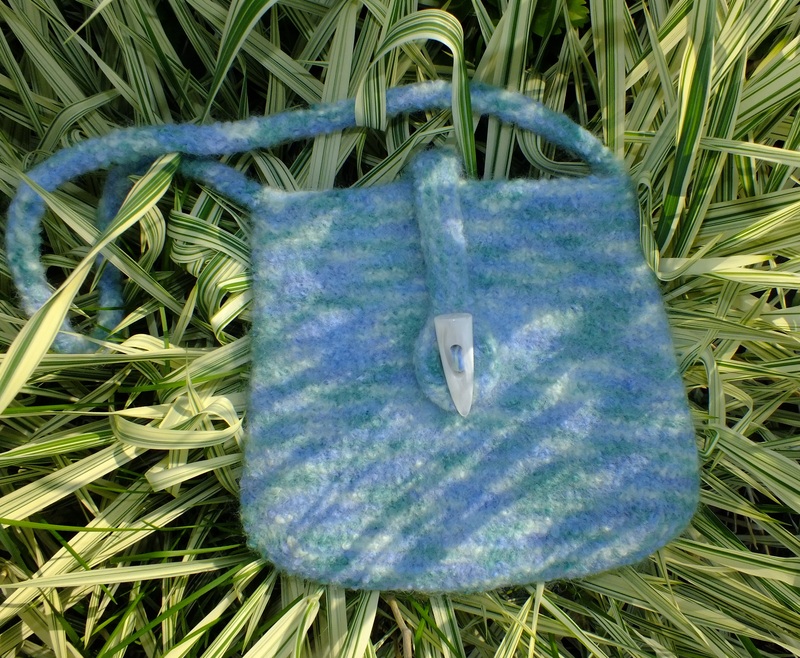 If you don’t like the fun fur you could do weaving with any yarn that you like. You would just have to remember to reverse the fabric if you just do weaving at the top. This is the size I was working for. I made it the same as the last one except that I only cast on 24 stitches for the bottom. 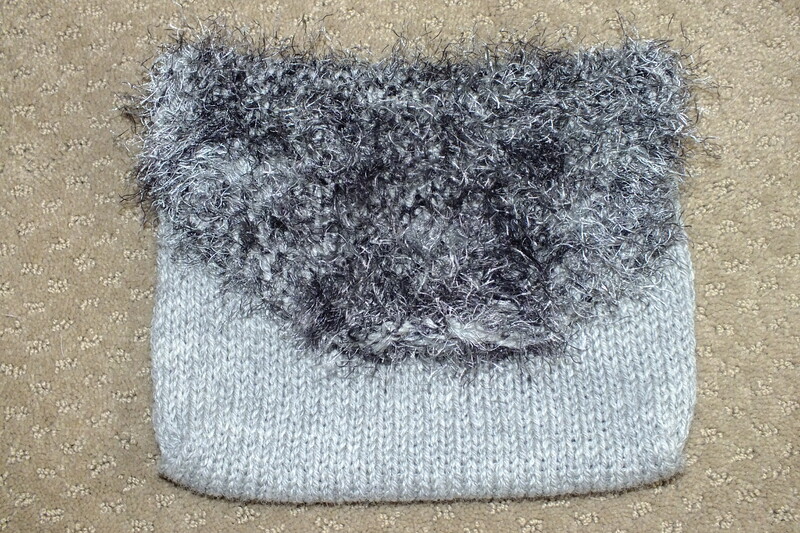 I added six stitches on the sides for the front only and knitted 52 rows. It will hold a cell phone, keys, credit cards without all the size and bulk. I used the Biscuits and Jam stripe generator web site that I love. Here is the link. If you want the complete written directions let me know. 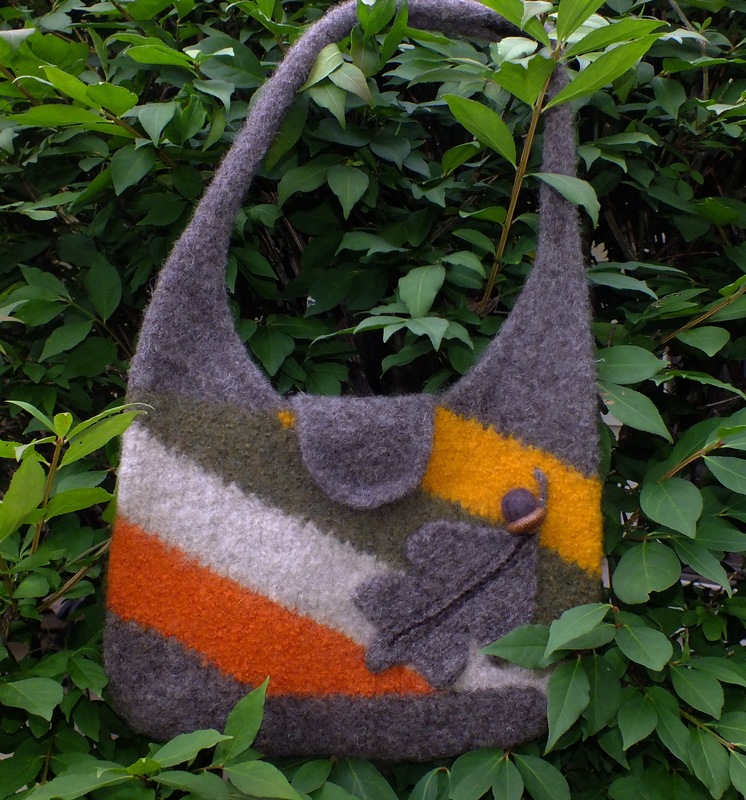 This is a great way to use up little bits of wool yarn left over from other projects. The finished size is 6 inches by 6 inches. Here is the link to my pattern.